Runnymede Racing’s multiple stakes winner Alwaysmining went a half mile in 49 seconds Saturday at the Fair Hill Training Center in Elkton, Md., in his final tuneup for next weekend's $125,000 Xpressbet Federico Tesio at Laurel Park. The work, third-fastest of 19 horses, was the third for the gelded Maryland-bred son of Grade 1 winner Stay Thirsty since running his win streak to five races, the last four in stakes, in the March 16 Private Terms at Laurel. On April 6, Kelly Rubley-trained Alwaysmining went five furlongs in a bullet 1:00. Both breezes came over Fair Hill’s all-weather surface. 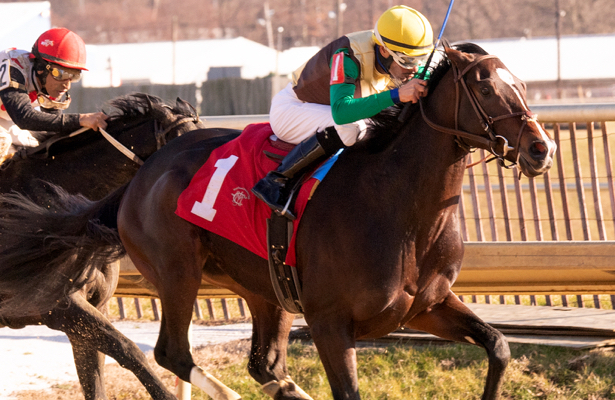 Alwaysmining will be stretching out to 1 1/8 miles for the first time in the Tesio, which for the fourth straight year is a "Win and In" race for Triple Crown-nominated horses to the 144h Preakness Stakes on May 18 at legendary Pimlico Race Course. The Private Terms, won by 6 ¾ lengths in front-running fashion, marked his two-turn debut. Fellow Fair Hill-based trainer Graham Motion, winner of the 2011 Kentucky Derby (G1) and 2013 Dubai World Cup (G1) with Animal Kingdom and whose 2008 Tesio winner, Icabad Crane, would go on to run third in the Preakness, has been impressed with Alwaysmining. The Motion-trained Still Dreaming, a half-brother to 2016 Derby and Florida Derby (G1) winner Nyquist, ran fifth behind Alwaysmining in the Private Terms before coming back to capture Saturday’s featured allowance at Laurel.